The American dog tick, or wood tick, is typically reddish-brown with gray and silver markings on its dorsal shields. Females have a shorter shield, while the males have a dorsal plate that covers most of their body. Unfed females are typically 5 mm long and are slightly larger than males, which are about 3.6 mm long. Females are normally very flat in appearance unless they are engorged with blood, in which case they can enlarge up to 15 mm long and 10 mm wide. Their mouthparts are short; once they cut into the skin with their two chelicerae, they anchor themselves with a single barbed structure called a hypostome. 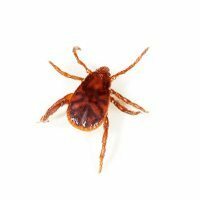 This tick is usually found in the United States, east of the Rocky Mountains. It can also be found in some parts of Canada, Mexico, and the Pacific Northwest. It is most commonly found on dogs as an adult. 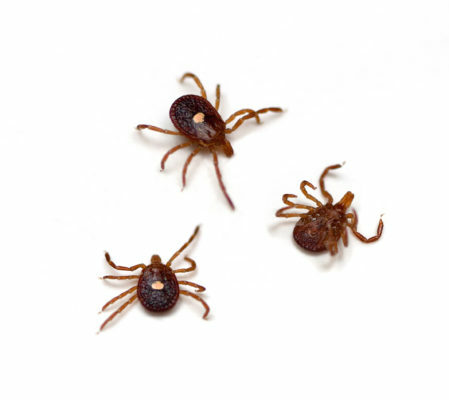 American dog ticks prefer woods and tall, grassy areas along animal trails. From the tops of tall blades of grass, they engage in a behavior called “questing”. This is when they attach to a passing animal and latch onto it. The animal becomes their host. Adults are most active late April through May. Ticks feed on the blood of their host. Hosts can range from small animals like mice all the way up to humans. 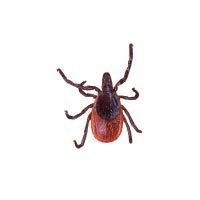 Ticks can spread disease by feeding from an infected host and passing the bacteria to their next host. This is how they spread diseases like Rocky Mountain Spotted Fever, of which they are a main carrier. 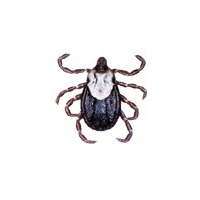 Like all ticks, the American dog tick goes through three stages: larva, nymph, and adult. They require at least one blood meal per stage to grow and develop. The larva and nymph stages prefer smaller animals to feed on, such as mice, squirrels, and chipmunks. Adults usually infest and feed on larger animals like dogs, deer, and raccoons. All stages will feed on humans. An adult female tick may lay thousands of eggs. Once the eggs hatch, the larval ticks rapidly disperse and normally find a small mammal or lizard as a host.